This unusual name is of English locational or topographical origin. 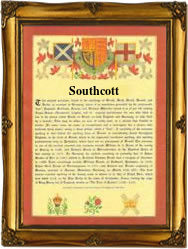 The source for the modern surname, which can be found as "Southcott" or "Sothcott" can be any of the places so called, for example "Southcott and Southcot" in Devonshire and in Cornwall and "Southcot" in Berkshire near Reading. The latter is first recorded in the Domesday Book of 1086 as "Sudcote". All the place names share the same derivation and meaning which is "the southern cottage", derived from the Old English pre 7th Century "sudth", south and "cot", cottage sometimes also "shelter for animals" especially for sheep. As a topographical surname, "Southcott" means "dweller at the southern cottage". One "Richard Southcott" of Devonshire is recorded on the Register of the University of Oxfordshire in 1586. The first recorded spelling of the family name is shown to be that of Geoffrey de Suthcot, which was dated 1229, in the Kent Curia Rolls, during the reign of King Henry 111, known as the Frenchman, 1216 - 1272. Surnames became necessary when governments introduced personal taxation. In England this was known as Poll Tax. Throughout the centuries, surnames in every country have continued to "develop" often leading to astonishing variants of the original spelling.